Attend the May 5 open house and see what’s being accomplished at the 1858 Meeting House, the former Second Baptist Church. 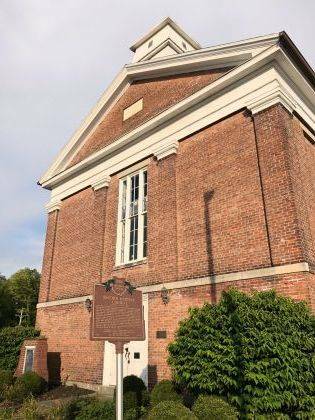 MECHANICSBURG – The Champaign County Preservation Alliance will hold an open house 4:30-6 p.m. Saturday, May 5, at the 1858 Meeting House, formerly the Second Baptist Church. Visitors will learn of the progress and renovations that have occurred with the structure, located on East Sandusky Street in Mechanicsburg. Originally constructed in 1858 as the first Methodist Church, the building has had numerous updates over the past 25 years and is undergoing an interior facelift with plasterwork, drywall, paint, lighting, window repair, mechanical updates and soon will have a new roof. Preservation Alliance’s intention is to preserve the history and integrity of the building and create a space for the pubic to use for events, community gatherings, meetings, etc. All are welcome to the open house and to help build the momentum as the work continues. For more information about the project or event, call Dusty Hurst at 937-869-0970. Submitted by Champaign County Preservation Alliance.